If you experience the exhaustion, body aches, sleep disturbances and digestive issues that come with adrenal fatigue, then today I have an alternative to the restorative yoga, yin yoga and yoga nidra that I usually offer you to cope with these symptoms. 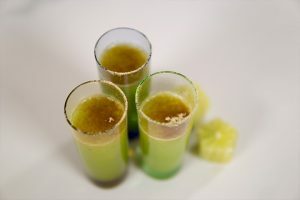 Today I am going to show you how to make a wellness shot for adrenal fatigue at home. The lime, celery and cucumber contain vitamins and minerals like potassium, natural sodium and magnesium, which help calm the nervous system signals to and from the brain, thus relaxing the body. 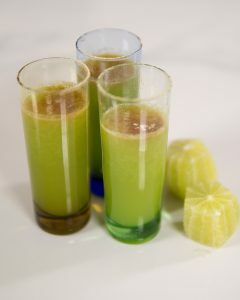 The celery will help to restore the adrenals. Cucumber helps to clear the kidneys of toxins. Lime reduces inflammation and lowers blood sugar. Our special ingredient today is from Botanica Health: it is their daily zen shot, previously known as Fermented Holy Basil. This will reduce stress and promote your gut health. Holy basil is wonderful for people suffering from adrenal fatigue because it helps to regulate cortisol. The sprinkle on the top, maca has also been shown to provide effective support for blown-out adrenals. The adaptogenic qualities of maca actually help your body normalize cortisol levels, reduce exhaustion from stress, and protect against other negative stress effects.